Although there is a good selection of ice creams listed below, there are a couple of things that I want to point out before you go any further! I haven’t calculated the SmartPoints for all brand flavours as obviously that would have taken forever! 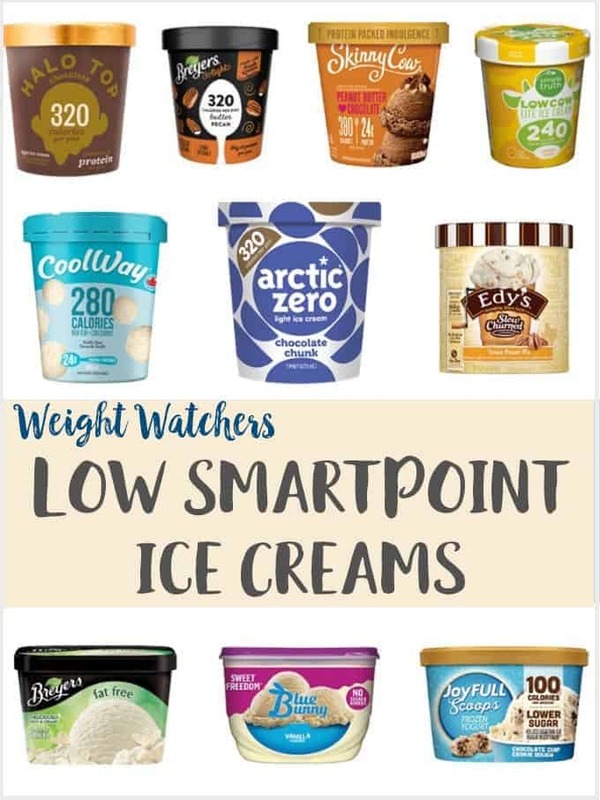 Just because Skinny Cow Vanilla Bean Ice Cream is 3 SmartPoints per serving doesn’t mean that Skinny Cow Chocolate Cake Me Away will also be 3 SmartPoints per serving! If the ice cream that you’re about to tuck into isn’t in the picture, please make sure that you work out SmartPoints yourself before you dig in! Some of these ice creams list both sugar and sugar alcohols in their nutritional information and some just list sugar. I have noted below each entry which ice creams include sugar alcohols. At the time of writing this list, WW does not require you to add sugar alcohols in the calculator to work out SmartPoint values. Therefore, the SmartPoint values have been worked out using the usual calories, protein, saturated fat and sugar counts. Be aware though that there can be some, ahem, side effects of eating (too many) sugar alcohols! If you want more information on these health facts, take a look at the FDA’s Sugar Alcohol Fact Sheet. All SmartPoints have been worked out using an official WW calculator and are correct at time of writing. 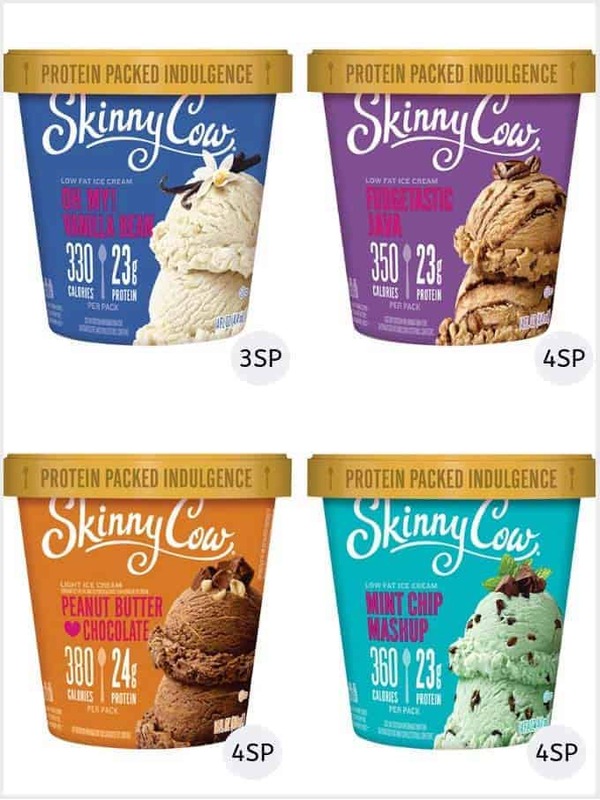 Skinny Cow Low Fat Ice Creams come in 14oz tubs and are available in a variety of flavours including Rock on! Rocky Road, Chocolate Cake Me Away & Oh Fudge Cookie. Buy Skinny Cow Low Fat Ice Cream from large food stores including Walmart and Target. The SmartPoint values above have been worked out on 1/2 cup of ice cream, which is equivalent to quarter of a pint tub. Sugar is listed in the nutritional information. 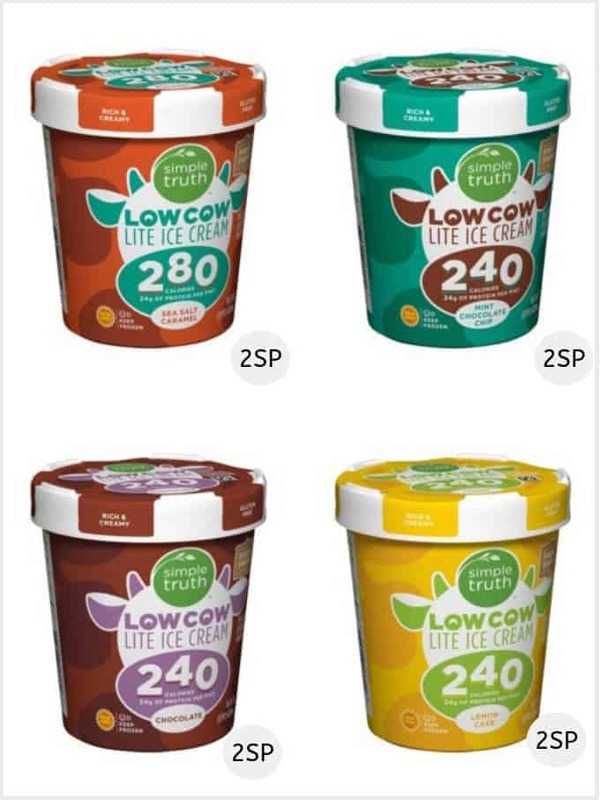 Simple Truth Low Cow Lite Ice Creams come in pint tubs and are available in a variety of different flavours including Vanilla Bean, Sea Salt Caramel and Birthday Cake. 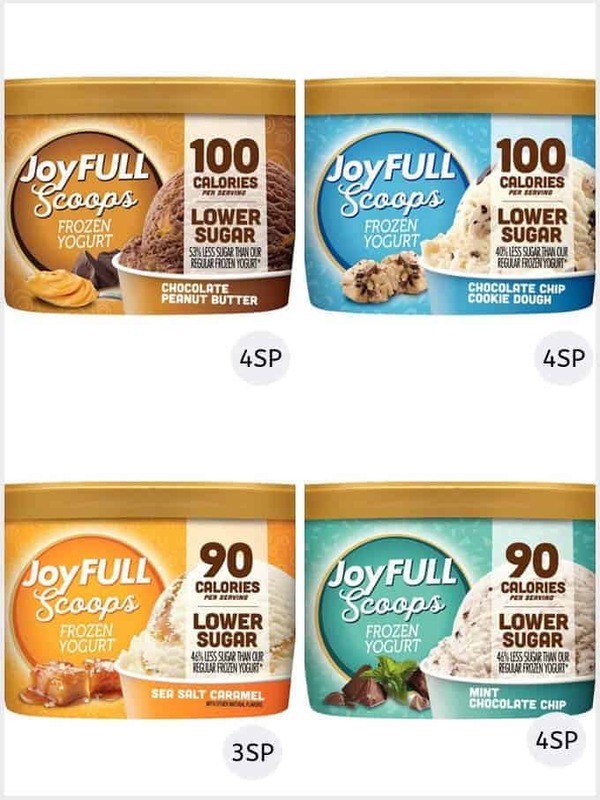 JoyFull Scoops Frozen Yogurts come in 1.5qt tubs and are available in a variety of different flavours including Sea Salt Caramel, Chocolate Peanut Butter and Chocolate Chip Cookie Dough. Buy JoyFull Scoops Frozen Yogurt from large food stores including Walmart and Target. The SmartPoint values above have been worked out on 1/2 cup of frozen yogurt (64g). 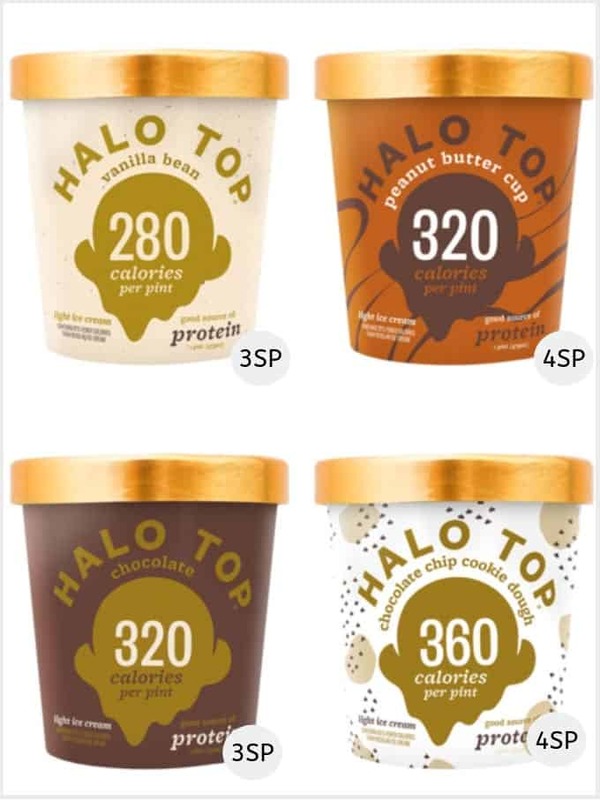 Halo Top Light Ice Creams come in pint tubs and are available in a wide variety of flavours including Lemon Cake, Black Cherry, Mint Chip, Cookies & Cream and Oatmeal Cookie. Buy from large food stores including Walmart and Target. 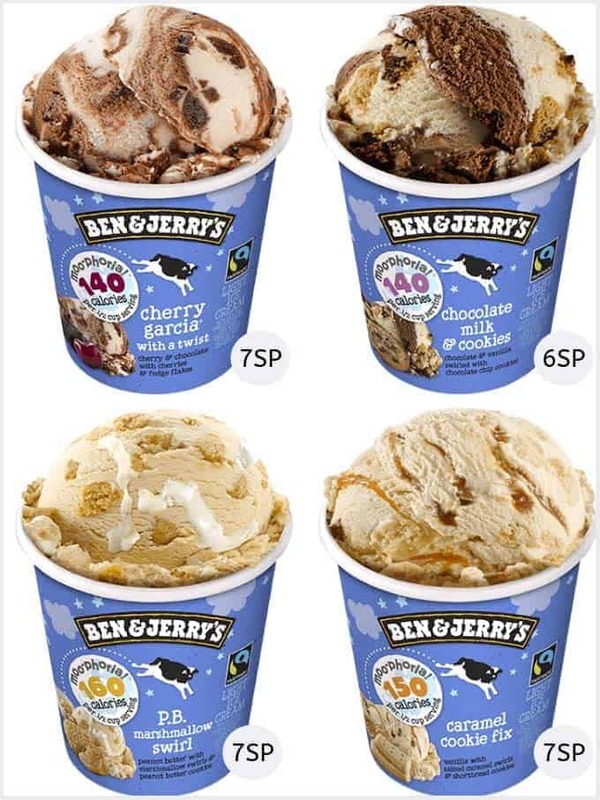 The SmartPoint values above have been calculated on 1/2 cup of ice cream which is equivalent to quarter of a pint tub. Both sugar and sugar alcohols are listed in the nutritional information. 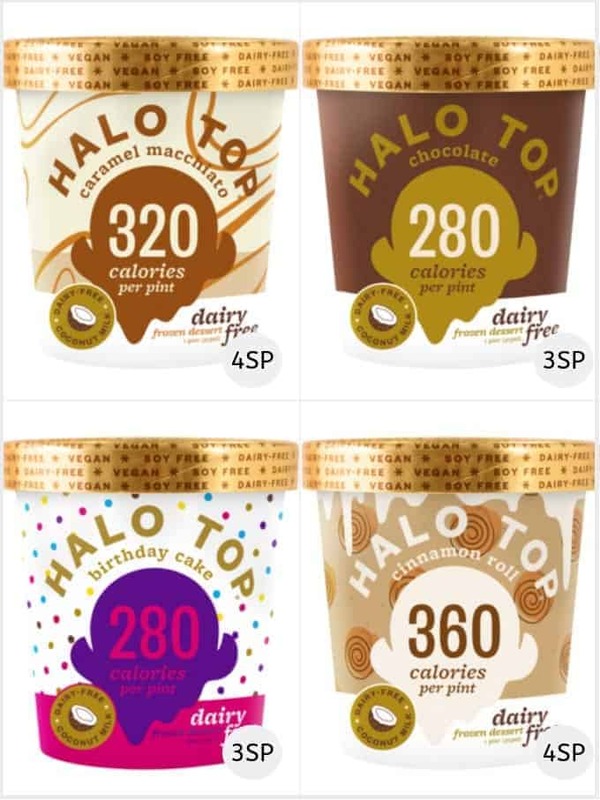 Halo Top Dairy Free Frozen Desserts come in pint tubs and are available in a wide variety of flavours including Birthday Cake, Candy Bar, Pancakes & Waffles, and Oatmeal Cookie. The SmartPoint values above have been calculated on 1/2 cup of ice cream (~65g) which is equivalent to quarter of a pint tub. 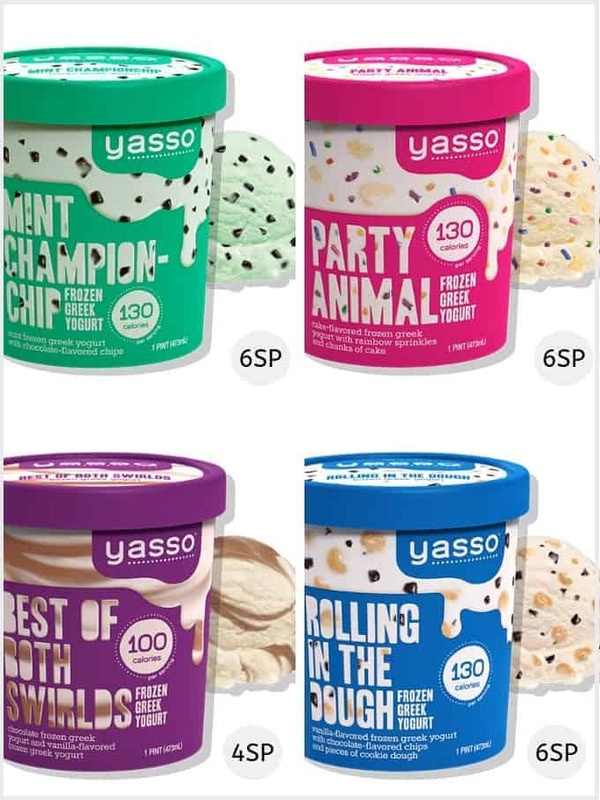 Yasso Frozen Greek Yogurts come in pint tubs and are available in a number of flavours including Coffee Brownie Break, Chocolate PB & Yay, Loco Coco Caramel and Party Animal. Buy from large food stores including Walmart, Kroger and Target. 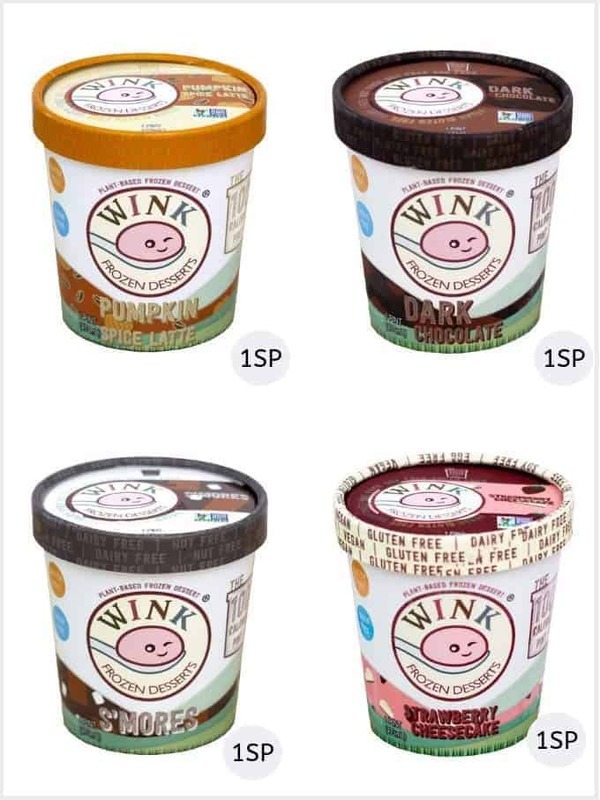 Wink Frozen Desserts come in pint tubs and are available in a number of flavours including Vanilla Bean, Cake Batter, Salted Caramel and Chocomint. They are sugar free, dairy free and plant based. Buy from stores including Bed Bath and Beyond, Busch’s, Shoprite and Whole Foods. 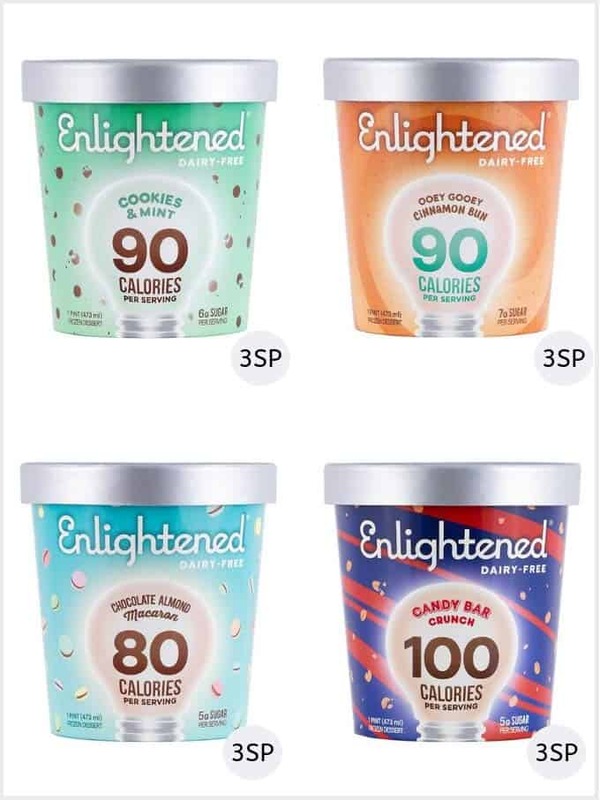 Enlightened Ice Creams come in pint tubs and are available in a number of flavours including Triple Shot Espresso, Movie Night, Marshmallow Peanut Butter and Glazed Donut. Buy from large food stores including Krogers and Target. They are also available to buy online here! 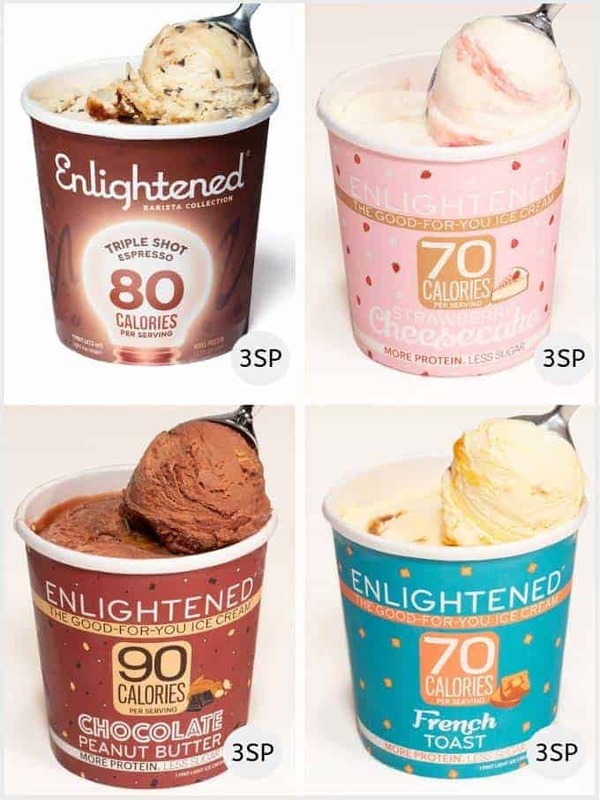 Enlightened Dairy Free Ice Creams come in pint tubs and are available in a number of flavours including Chocolate Almond, Candy Bar Crunch, Monkey Business and Cookies & Mint. Buy it from large food stores including Krogers, Publix, Safeway and Shoprite. 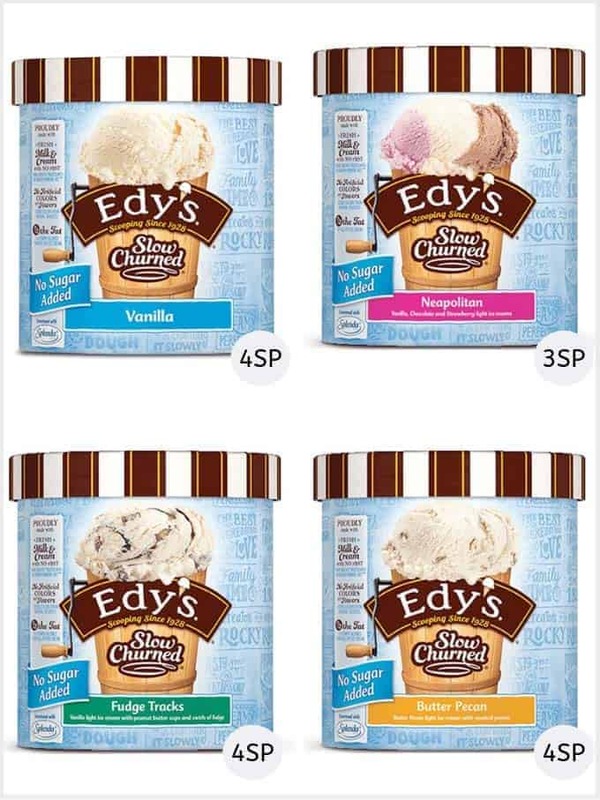 Edy’s / Dreyer’s Slow Churned No Sugar Added Ice Creams are available in 1.5 qts tub and come in flavours including Butter Pecan ,Fudge Tracks, Neapolitan and Triple Chocolate flavours. The SmartPoint values above have been calculated on 1/2 cup of ice cream. 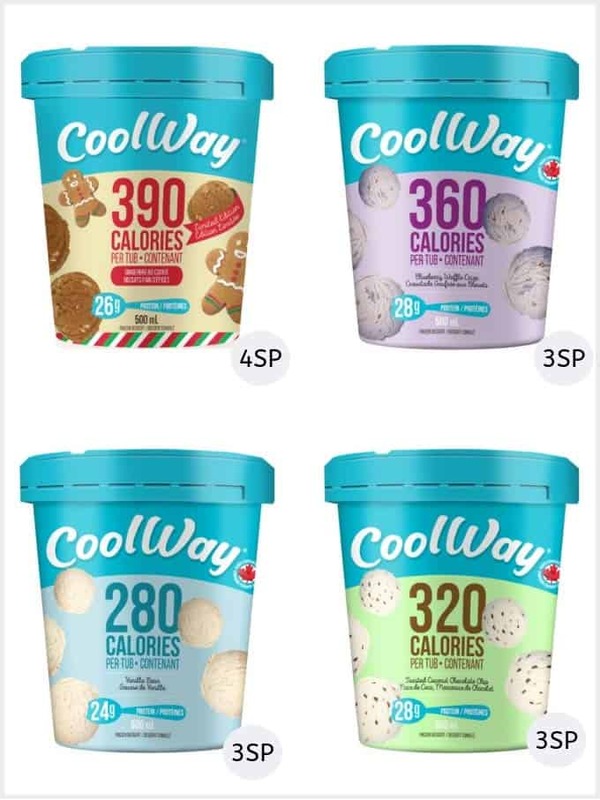 CoolWay Ice Cream come in pint tubs and are available in a number of flavours including Gingerbread Cookie, Salted Caramel, Vanilla Bean and Blueberry Waffle Crisp. They are a Canadian company and are available to buy from stores including Walmart, Metro, Whole Foods and Longo’s. 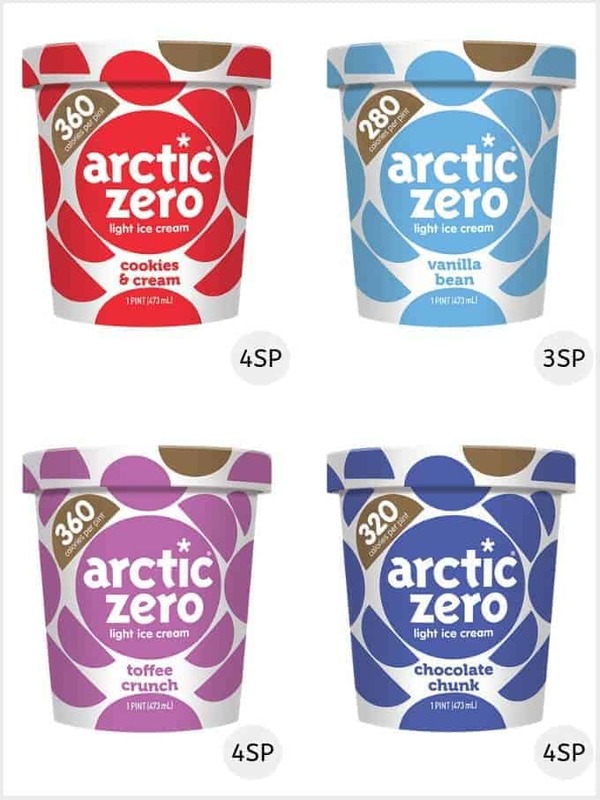 Arctic Zero Light Ice Creams come in pint tubs and are available in a number of flavours including Chocolate Chunk, Cookies & Cream, Peanut Butter & Cookies and Mint Chocolate Cookies. Buy from Walmart stores and also online in a variety pack from Amazon. 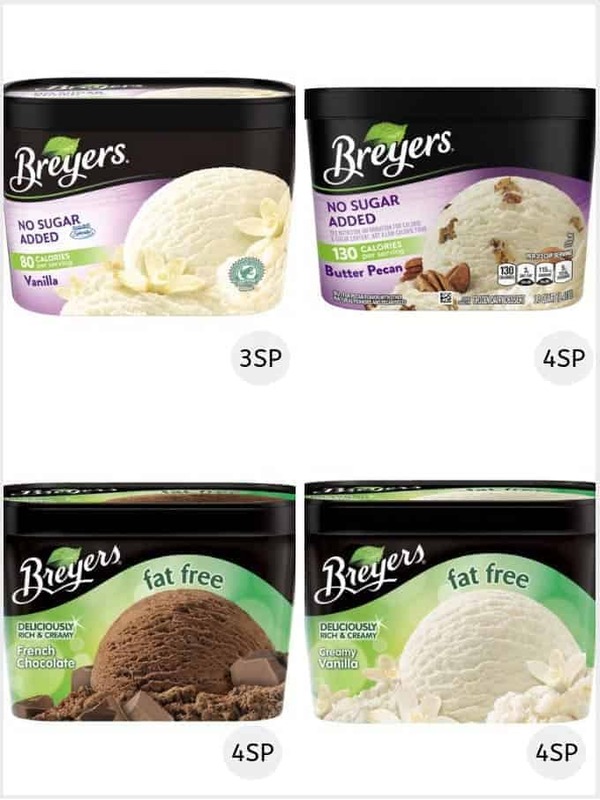 Breyers No Sugar Added Ice Cream come in 1.5 QT tubs and are available in a few different flavours such as Vanilla, Caramel Swirl and Butter Pecan. Their Fat Free Ice Creams come in Chocolate or Creamy Vanilla flavours. Buy from large supermarkets including Kroger, Walmart and Target. 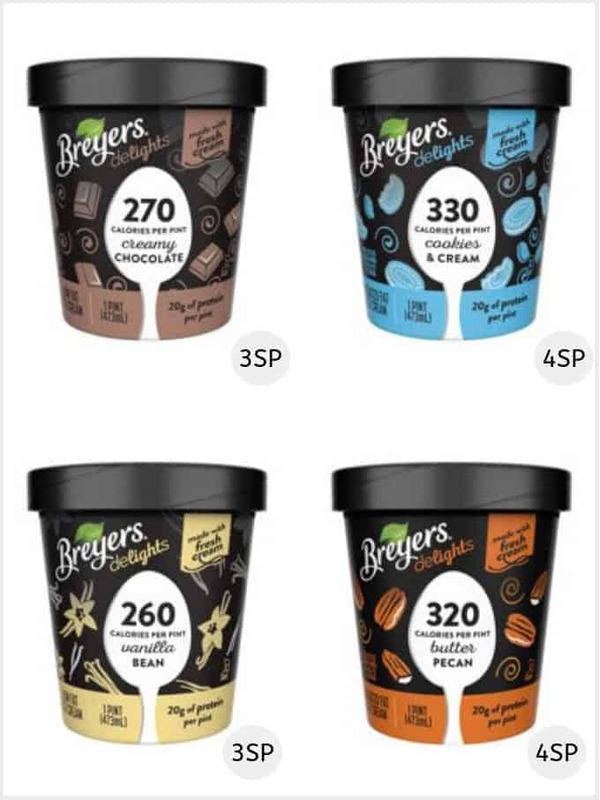 Breyers Delights Ice Creams come in pint tubs and are available in a few different flavours such as Butter Pecan, Cookies & Cream, Vanilla Cupcake and Raspberry Fudge Swirl. They are available to buy from most large supermarkets including Kroger, Walmart and Target. The SmartPoint values above have been calculated on 2/3 cup of ice cream which is equivalent to a third of a pint tub. 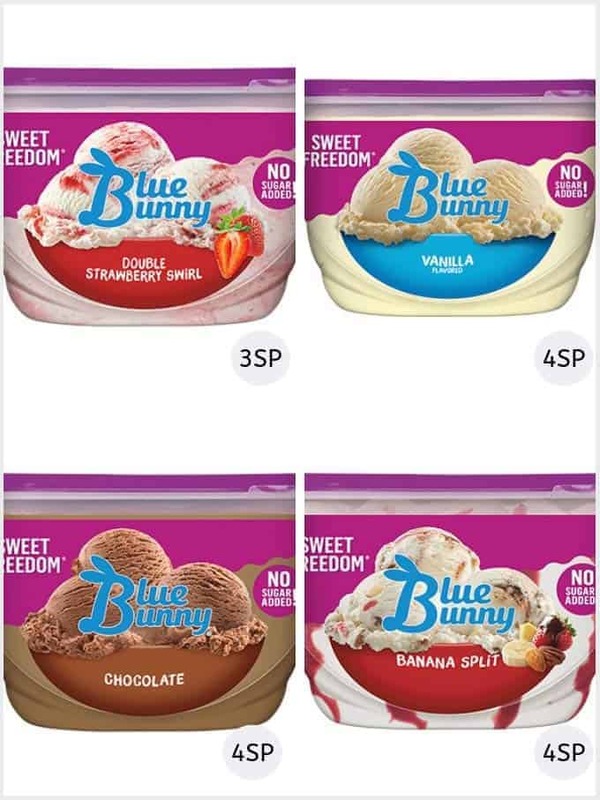 Blue Bunny Sweet Freedom Ice Creams come in 1.5 QT tubs and are available in a number of flavours including Vanilla, Butter Pecan, Banana Split and Peanut Butter Party. They are available to buy from most large food stores including Walmart and Target. Ben & Jerrys Light Ice Creams come in pint tubs and are available from most large food stores including Walmart and Target. They are available in a number of different flavours including Chocolate Cookie EnlightenMint, Mocha Fudge Brownie, PB Marshmallow Swirl and PB Dough. 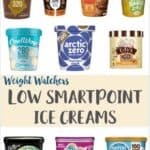 The SmartPoint values above have been calculated on 1/2 cup of ice cream which is equivalent to one quarter of a pint tub. 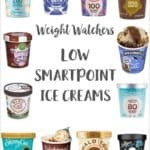 If you like this list of Weight Watchers ‘essentials’ you may also like these Low Point Breads, these Low Point Cookies or these Low Point Coffee Creamers. But how do they taste? In my experience, Halo (and I assume similar brands) are cloyingly sweet and have a weird mouthfeel. For me, the Breyer’s no added sugar/reduced fat provides almost the same soul satisfying feeling you get from premium ice cream without the nasty additive filled products and are well worth an extra point or two or three. Granted, I haven’t tried most of the products listed, but would try them if anyone can provide some comments on their taste. Thanks! Thank you for your comments Kathy! I haven’t tried many of them (purely because they are not available where I live). I’ve tried Halo Top, Skinny Cow and Ben & Jerry’s! Of those Ben &Jerry’s is by far my favourite…but of course it is higher in Smart Points than many of the others! I’ll track down (& report back) the Coolway when I am in Canada next month!